Ergin Çavuşoğlu, Percé Rock, 2016. Cast polyurethane resin, 30 x 200 x 35 cm (without plinth), 70 x 230 x 70 (with plinth). Photo: Chroma (Andre Carvalho and Tuğba Karatop). Which sun gazed down on your last dream? Which sun gazed down on your last dream? *: A question that Charles Baudelaire asks in his On Wine and Hashish, a seminal work on the effervescence of intoxication, its ability to render a person outside of time, memory, and place. It is an inherently surreal question too, and one perhaps that only the “intoxicated” can poetically and surreptitiously ask; it is also a question that asks “where,” but of a “where” that is placeless, nationless, outside of borders, a “where” which is almost spiritual. Ergin Çavuşoğlu’s third solo exhibition at RAMPA, Which sun gazed down on your last dream?, (March 10 to May 7), is in fact akin to variants of this question, and to a kind of metaphoric inebriation from wondering and wandering subliminally about and in the trivialities of the world, stuck in an in-between, a liminal space. Çavuşoğlu has an engendered interest in the idea of travel, or movement and migration—not just of people, but of things, objects, ideas. In this he finds the space or place, the surrealities that most interest him. But, it is not the imbedded meaning of the thing that he finds most fruitful. This Duchampian ideology runs throughout this multifaceted exhibition, (which includes video, sculpture, painting, and photography), as well as his oeuvre. Spaces of temporality or placeless spaces are precisely the point for Çavuşoğlu. In an in-between space room is left for possibilities, for thought. Indeed, finding the beautiful in anything is a spiritual awakening of sorts, and seeing the beautiful in everyday things is the kind of Dadaist hymnal that Çavuşoğlu’s works ask us to revel in. 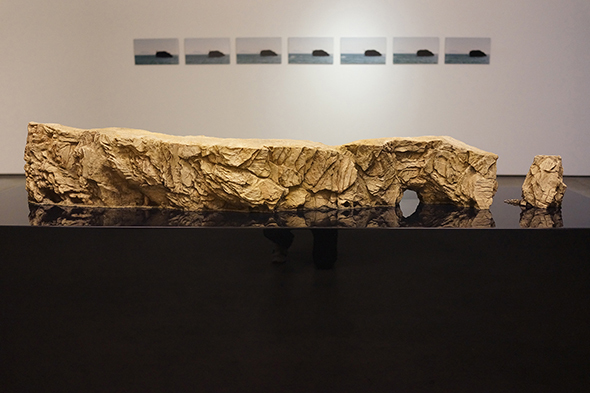 Çavuoğlu took part in the Turkish Pavilion at the 50th Venice Biennale in 2003. Recent solo exhibitions include Cinefication (Tarot & Chess), in The Image Generator II, Extra City Kunsthal, Antwerp, Belgium (2016); Liquid Breeding, YARAT Contemporary Art Space, Baku, Azerbaijan (2015); Adaptation – Cinefication, Rampa, Istanbul (2014); Ergin Çavuşoğlu – Dust Breeding, The Pavilion, Downtown Dubai (2011); Alterity, Rampa, İstanbul (2011); Crystal & Flame, PEER, London (2010); Ergin Çavuşoğlu, Ludwig Forum für Internationale Kunst, Aachen, Germany (2009–10); Haunch of Venison, London (2004 and 2009); Place After Place, Kunstverein Freiburg, Germany (2008); Quintet Without Borders, ShContemporary, Shanghai (2008); Haunch of Venison, Zurich (2007); Point of Departure, John Hansard Gallery, Southampton and NGCA Sunderland, United Kingdom (2006); and Entanglement, DCA, Dundee, United Kingdom (2004). Group exhibitions include But a Storm Is Blowing from Paradise, Solomon R. Guggenheim Museum, New York (forthcoming); Apricots From Damascus (An apexart franchise exhibition), SALT, Istanbul, 4th International Canakkale Biennial (2014); Other Waters, Te Tuhi Centre for the Arts, Auckland, New Zealand (2014); Artists in Their Time, Istanbul Modern, Istanbul (2015); Plurivocality, Istanbul Modern, Istanbul (2014); The Best of Times, The Worst of Times; Rebirth and Apocalypse in Contemporary Art, First International Contemporary Art Biennial, Arsenale, Kiev (2012); Migrasophia, Maraya Art Centre, Sharjah, United Arab Emirates (2012); Seven New Works, Borusan Contemporary Museum, Istanbul (2011); Zwölf im Zwölften, TANAS, Berlin (2011); Paradise Lost, İstanbul Modern, İstanbul (2011); Manifesta 8, Murcia, Spain (2010); fast forward 2 The Power of Motion, Media Art Sammlung Goetz, ZKM Museum of Contemporary Art, Karlsruhe, Germany (2010); HomeLessHome, Museum on the Seam, Socio-Political Contemporary Art Museum, Jerusalem (2010); The First Mediterranean Biennial of Contemporary Art, Haifa, Israel (2010); There is no Road, LABoral Centro de Arte y Creación Industrial, Gijón, Spain (2009); All Inclusive – A Tourist World, Schirn Kunsthalle, Frankfurt (2008); Between Borders, MARCO Vigo, Spain (2007); British Art Show 6, United Kingdom (2005); the 3rd Berlin Bienniale (2004); the 50th Venice Biennale (2003); and the 8th İstanbul Biennial (2003). Ergin Çavuşoğlu currently lives and works in London, United Kingdom.